The ASUCI elections are upon us and one of the most critical issues up for a vote is the Measure U Referendum. So, what’s the big deal? 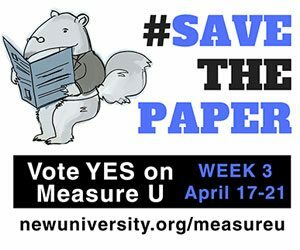 The Measure U Referendum is a $3 quarterly fee to fund and support the operation of UCI’s student newspaper, the New University. The New U is an independent and student run organization that currently only receives monetary support from advertisements and the current Measure U referendum, which is 99 cents a quarter. The New U says that they have had to cut print circulation and staff salaries in order to keep the print version of the newspaper alive. According to an editorial on their website: “We understand that tuition already puts a hefty monetary stress on students, but if you vote to contribute just $3 to the New U each quarter, it will be enough to keep UCI’s journalistic legacy going. A newspaper is nothing if not transparent – we are not here to take your money and spend it frivolously without your knowledge. Essentially, Measure U is an extension of the previous referendum with an increase from 99 cents a quarter to $3 a quarter. Only undergraduates would be charged this fee. In order to pass, the referendum needs a 60% ‘Yes’ vote and there must be 20% voter turnout. At the time of publishing this article, the undergraduate voter turnout rate was 16.05%. The election closes April 21st at 5pm. You can vote here.